The average semi or 18-wheeler truck gets about six miles per gallon. Not only do we have to battle immense traffic, potholes and constant construction on our Dallas roads, we have to do it all smashed amidst huge diesel trucks. I worry about the emissions from my car, but every time I’m near the gigantic trucks, I peer over, pondering their current gas mileage and emissions. Well, I went down the rabbit hole and uncovered some environmental news that somehow slipped past my eyes this summer. Do you know about “glider” trucks? Here’s the rundown. Glider trucks are old engines masked under new exteriors. Companies refurbish old diesel engines, usually pre-2007, and place them into new outer truck bodies. If old engines are rebuilt following specifications, the engines only need to meet pre-2007 era diesel emission standards. 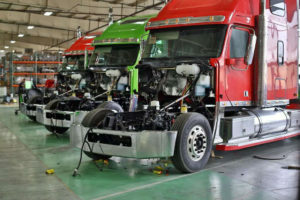 Companies claim these glider trucks are better for the environment because they are refurbishing old parts, but in reality, they’re trying to find their way through emission loopholes. The average semi or 18-wheeler truck gets about six miles per gallon. But in the last few years, emission controls have come a long way on semis. A diesel truck from 17 years ago is more than 98 percent dirtier than one today. Reusing old truck engines is emitting more pollution than reusing old parts. New engines are designed to be cleaner and are about 3-4 percent more efficient in fuel use. 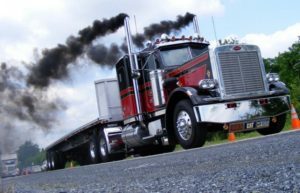 The Environmental Defense Funds reports one dirty engine glider kit can emit as much pollution as 450 clean trucks. Now that we’ve got the basics of gliders, let’s run down the crazy politics that have surrounded them in the last few months. During the Obama era, stricter regulations were put on controlling soot and other pollutants from large semis to help combat climate change. In November of 2017, the Environmental Protection Agency (EPA), under the direction of Scott Pruitt, proposed a rule to repeal these tighter emission standards for glider trucks. Pruitt said they were repealing the rule because it expanded the governmental reach and put an entire industry of specialized truck manufacturers out of business. As the chief of the EPA, his priorities should have been maintaining air quality for U.S. citizens. On Pruitt’s last day in office in July 2018, after heavy lobbying from the glider industry, he granted a loophole to allow an increase in the manufacturing of glider trucks. This would allow the EPA to avoid enforcing the annual cap of 300 gliders per manufacturer through 2019. The primary glider company, Fitzgerald, made 3,000 glider trucks in 2017. A far cry from the 300 max limit Obama-era standards required. In late July 2018, Andrew Wheeler, the new acting EPA administrator, reversed Pruitt’s policy. Glider trucks would again be limited to 300 per manufacturer. But will they? Wheeler has plans to continue the repeal of the Obama-era regulations on diesel trucks with a regulation that aims to eventually exempt glider trucks from greenhouse gas emissions. To report a smoking vehicle in Texas, call toll-free 800-453-SMOG (7664). It’s time to hold our EPA accountable for prioritizing our air quality and human health over corporate industry interests. An estimated 10,000 glider trucks on the road would lead to as many as 1,600 premature deaths from asthma and lung disease in the U.S., according to the EPA. Consider these facts the next time you’re wedged next to a semi-truck in traffic. As far as I can tell, there’s not an easy way to determine what a truck has under its hood. But, the next time I’m behind one that’s spewing soot and the engine’s roaring with the intensity of an airplane landing, I’m going to assume it’s an engine meeting the old standard. Time to move into the age of cleaner energy. To report a smoking vehicle in Texas, call toll-free 800-453-SMOG (7664) or dial #SMOKE (#76653) from your wireless phone. Don’t Choke, Call #SMOKE!